Esperanza Academy Dance Ensemble performs at Puerto Rican flag raising ceremony. 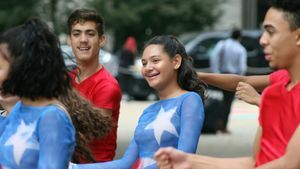 Since its founding 30 years ago, Esperanza has carried out its mission to transform the Hispanic community, in Philadelphia and around the country. An initiative that began with just a handful of employees, now boasts a $40M annual operating budget, 365 employees, and a broad array of institutions, real estate developments, and programs. Through education, economic development, capacity building, and advocacy, Esperanza has become a leading voice for Hispanics in America. Note: The above description came from the organization's Our History & Impact page. This page was last edited on 18 December 2018, at 11:56.